While a huge crowd watched the President getting sworn in this morning at the Capitol, another group congregated for a different cause…drone attacks. Drones are robot controlled missiles used to attack suspected terrorists. About 100 people gathered at Malcolm X Park to protest President Obama’s policies concerning the use of droids overseas. The demonstrators traveled from all parts of the country, including San Francisco and Boston to voice their protest. 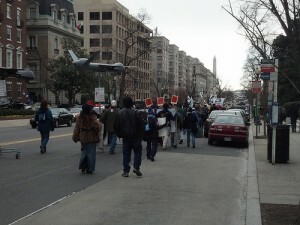 Participants waved posters and carried banners as they walked up 16th Street toward the National Mall. Several members rolled droid replicas and carried a huge 12 foot cloth spine. They chanted “war and murder, not in our name” as they marched in unison. Stop Patriarchy member Riley Ruiz emphasized, “American lives are not more important than any other lives.” She equated the killing of 20 children in Newtown, Connecticut to the mass murders of innocent children in countries like Pakistan and Yemen. The peaceful protest ended at 16th and K Street where participants were met by a National Guard blockade. However, protestors didn’t let the barrier stop them. They continued to shout slogans and sport banners despite the presence of authority. No one was arrested.